Vaginal birth after a previous caesarean (VBAC) should be possible for 70 - 80% of women. There is very little good research into planned vaginal birth after a previous caesarean section versus planned repeat caesarean section. 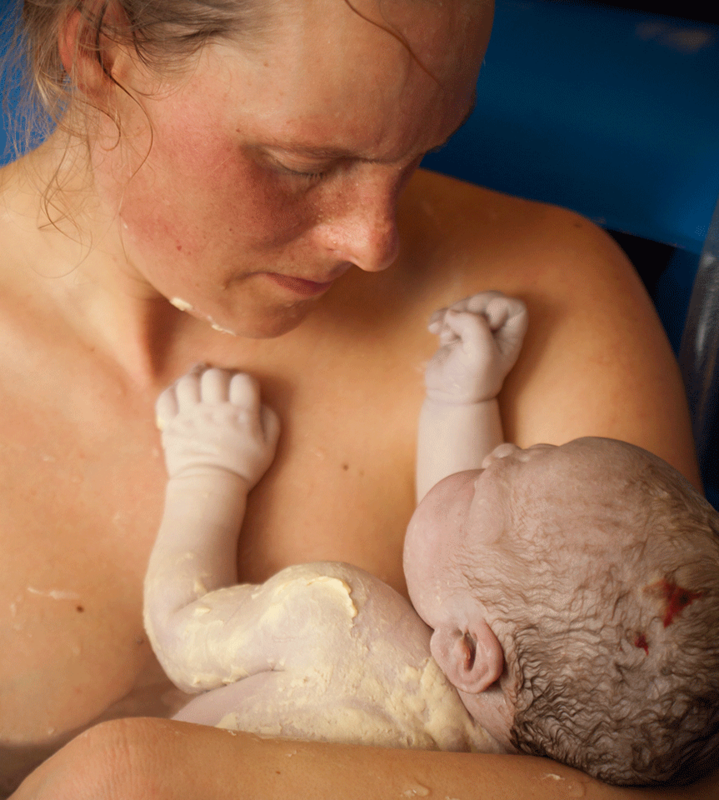 The evidence suggests that there is no significant difference between planned caesarean birth and planned vaginal birth for the mother. There is some difference in study results relating to outcomes for the baby. Results vary from finding no significant difference to a small increase in risk of neonatal death for the baby of 1 in 1,000. Many hospitals place restrictions upon labouring women attempting a VBAC which make a normal birth harder to achieve. The latest review from the Cochrane Pregnancy and Childbirth Editorial Group (Dodd et al. 2013), found that there were no significant differences between planned caesarean birth and planned vaginal birth identified for mother and baby. However the size of the group of women studied in the review was only 22, due to the lack of good research studies. The authors recommend that randomised controlled trials are required to provide the most reliable evidence. Other large reviews have found that a repeat caesarean is actually riskier for the mother than a planned vaginal birth, with the risks for the baby being around the same. Uterine tears or ruptures occur in less than 2% of VBACs, which is the same as the number seen in women who have a repeat caesarean section. Rupture of a uterus along a caesarean section scar is not fatal for the mother, serious ruptures are a rare complication during VBAC. Women who have had more than one previous caesarean section are at slightly higher risk of uterine rupture than those who have only had one previous caesarean section, but the ruptures tended to be without other symptoms or consequences. Success rates for women vary according to the nature of the reason given for the previous caesarean section. Women who required a caesarean section for ‘failure to progress in labour’, dystocia or cephalopelvic disproportion had the lowest success rates. Mothers who had had a previous vaginal birth in addition to their previous caesarean sections were more likely to give birth vaginally than mothers with no previous vaginal births. This advantage was larger in those mothers who previous vaginal birth occurred after rather than before the original caesarean section. The research shows that the increase in a woman’s risk of uterine rupture if her labour is induced with an intravenous oxytocin drip or using prostaglandin gel is extremely small. Uterine ruptures are most likely to occur if the woman has received both of these medications, rather than a single medication (Enkin et al. 2000). The research shows that using an epidural does not increase the risks from uterine rupture in women who have had a previous caesarean section (Enkin et al. 2000). If the woman requires a rapid response emergency caesarean for a potentially catastrophic complication, many of the preparation procedures have already been completed such as the insertion of a intravenous canual and taking blood for group and type matching. The risk of the woman choking on her stomach contents is reduced if a General Anaesthetic has to be administered for a rapid response emergency caesarean section. The likelihood of the woman requiring a rapid response emergency caesarean section under general anaesthetic is very small, as it is in normal vaginal birth (Enkin et al. 2000). Early hospital admission has been shown to increase the risk of intervention and doubles the likelihood of a caesarean section (Bailit 2005 and Rahnama 2006). The UKs National Institute of Clinical Excellence states that the length of established first stage of labour varies between women. First labours last on average 8 hours and are unlikely to last over 18 hours. Second and subsequent labours last on average 5 hours and are unlikely to last over 12 hours. A policy which places a restrictive time limit on the length of labour will increase rates of intervention and caesarean birth (NICE 2014). Undertaking emergency procedures on admission to hospital has the potential to undermine a women's confidence in achieving the outcome of a normal birth. Intravenous canulas can restrict a woman ability to weight bare on the hand in which they are inserted and can cause continuous discomfort or pain. The latest systematic review of the best evidence around the benefits of continuous electronic fetal monitoring, found no difference in perinatal death or cerebral palsy, apgar scores, neonatal admissions or hypoxic ischaemic encephalopathy. Continuous electronic fetal monitoring did result in a 50% reduction in neonatal seizures 1:660 (but over time this was shown to be of no significance to babies' health) and a significant increase in the number of caesareans and assisted vaginal births (Alfirevic et al. 2013). A randomised controlled trail looking specifically at women attempting a vaginal birth after a previous caesarean found higher vaginal birth rates in the intermittent fetal monitoring group, and higher caesarean rates in the continuous monitoring group, and no impact on perinatal outcome (Madaan and Trivedi 2006). Enkin, M., Kierse, M., Neilson, J., Crowther, C., Duley, L., Hodnett, E., and Hofmeyr, J. (2000) A Guide to Effective Care in Pregnancy and Childbirth. Oxford: Oxford University Press. The increase in risk for the baby when comparing VBAC with a repeat caesarean section (Enkin et al. 2000). The number of women for whom a vaginal birth after a previous caesarean section (VBAC) should be possible (Troyer et al.1992 and Weinstein et al.1996). The number of women who had a vaginal birth after a previous caesaraean section (VBAC) in 2012 (Li et al. 2013).